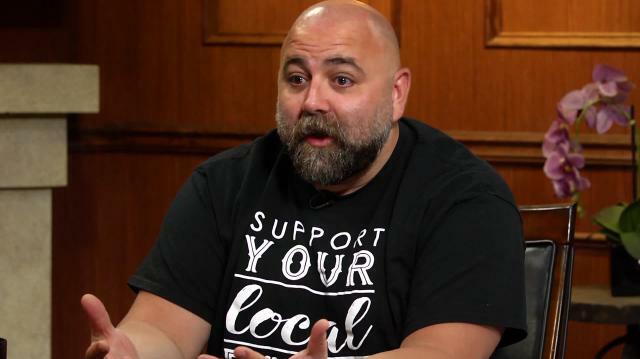 Duff Goldman explains the almost accidental path he traveled to become a cake master. Larry King: How did you become a cake master? Larry King: That’s a specialty isn’t it? Larry King: So great chefs, a lot of times, they don’t make desserts? Duff Goldman: They don’t make desserts. And what happens is, when you get somebody like me, who is good at cakes, everywhere I worked, I was the cake guy. Because inevitably, you’ll have an emergency, somebody just coming in, “Oh I got this last-minute birthday, we need a cake.” “Oh my god, anyone in the kitchen, can anyone in here make a cake?” And I was always like, “Me,” so I became the cake guy.